Whitehaven Civic Hall reopens this week as the first new tenant hosts a careers event and takes up office space in the centre of the town. Copeland Borough Council is securing new tenants for the building, raising additional income to invest in services. 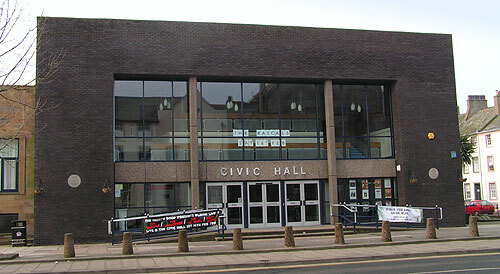 The Civic Hall closed in October 2013 as due to Government funding cuts the £250,000 subsidy was unaffordable. However in November Copeland Borough Council announced plans to find new tenants to raise income from the hall in the short term. The first organisation to move into the Civic Hall is Inspira, and the council are currently in negotiations with others organisations to secure more tenancies. Copeland Borough Council’s Chief Executive, Paul Walker said: “We have been working to bring the building back into use, however there have been a number of health and safety issues that by law must be addressed when a building has been out of use for that length of time. “This, along with cleaning and other preparation has cost around £8,000 – which has been budgeted for and, since it is part of an accommodation plan to save the council £500,000, represents good value for the money. Leader of Copeland Council, Cllr Elaine Woodburn said: “It was a really difficult decision made by Full Council to close the Civic Hall so it is good to see the Civic Hall being brought back into use. The Council’s Executive agreed back in November that as part of our accommodation review the Civic could be used in the short term as an available space for commercial and community service. “Not only is this bringing people into the town centre, which is part of the continued efforts to develop economic growth of Copeland, it is importantly generating income that can be invested back into services.